to which you can affix your signature. to whom you can present it. "We are living IN the Body. Not ON the Body, but IN the Body." 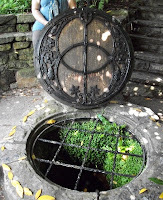 Soon to return to the States, and the "states of mind" that are part of returning to the familiar world, I decided to visit the Chalice Well a last time. The sense of elemental Presence, of the Goddess, of countless pilgrims before me, of genus loci, is so potent there. I took some water to carry back in a flask, and thanked the Chalice as I drank, engaged in what I realized was a private Communion ceremony. Then walking up the hill on the path, I ate an apple of Avalon. "My Body, My Blood"....... and my body, my blood, the holy well travels as my own essence, nourishing my body and my thoughts. How strange, to remember my long, long ago Episcopalian Communion services, here at the Red Spring. But, why not? I am sure I would offend many Christians for saying it, but isn't this the true source of that communion? In it's highest meaning, taking in the "blood and body" of Christ means taking in that spiritual essence that is identified as holy, the Light, Christ consciousness. For me, that gift of wholly light flows from the ground in abundance, hangs round and sweet from the trees, offering, always offering me not "salvation", but a reminder of my Inclusion in the circle. I found a bench to sit on, and a great abundance of apples. Being blissed out, it took a little while to notice a Dragonfly - just one - that seemed to be buzzing me. It darted in front of me, then forward, back again, then forward. After a while, laughing, I said "ok, Dragonfly, let's pretend you want me to follow you." At which point, darn if it didn't become even more excited, darting down the path, and then back. So I got up, and followed the Dragonfly down the inlaid stone trail. 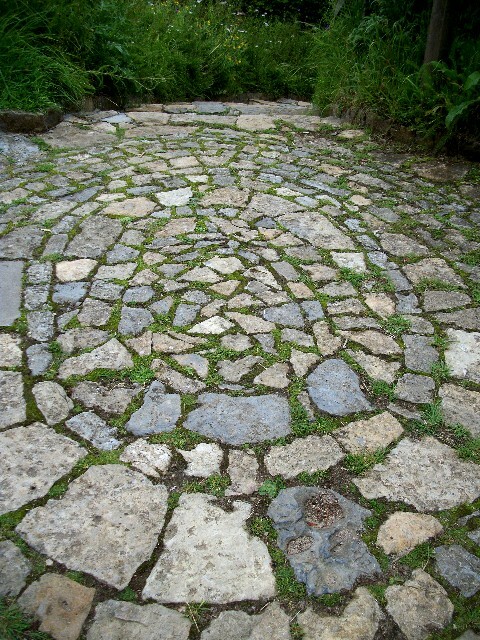 At intervals, the stones are inlaid into spirals or stone circles. Darting ahead, the Dragonfly came to rest in the exact center of the circle in front of me. And so, amazed, I sat down on the path (fortunately, no one was behind me) and contemplated this lovely encounter. After about 5 minutes, Dragonfly flew off and disappeared. "The word Dragonfly has its source in the myth that Dragonflies were once Dragons." I've often written about what I like to call the conversant world.....but here was an encounter that left me breathless. And like all real Communion, there are many layers of meaning. But what this gift means to me is to always remember, coming from that place of personal pilgrimage and "en-lighten-ment".........to hold to the center, to re-member. I'm leaving, returning to my daily life soon. I think I was given a perfect blessing and a reminder for the future. May I always return in spirit to that Holy Well, to remember, to be re-freshed. Of course, no trip home could be complete without visiting the great stone monuments of the sacred landscape that is the Salisbury Plain. 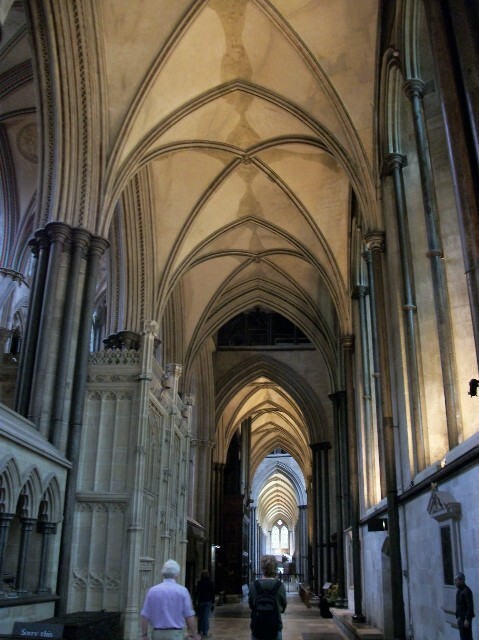 5,000 year old Stonehenge, mysterious and awe inspiring, surrounded with its huge circle of worshipful, camera snapping tourists, and then the equally amazing, 1,000 year old stone and glass Salisbury Cathedral. Having spent so many years in Circles, and read so many fantasy books as well that included imagined Pagan rites in places like Stonehenge...........I had to laugh at the intensity of hundreds of tourists, dashing out of the many nearby thundering buses, to encircle the mighty circular henge of the stones, worshiping them with snapping cameras and brightly colored umbrellas. "I'll be darned", I thought. "Services are still going on here!" As the tour guide reminded us, Stonehenge sits in the center of a sacred landscape, that includes the many barrows, and not so far away, the henge and avenues of Avebury. If you include in the picture the idea of energy leys that dowsers and geomancers speak of, tracing the "Dragon lines of ancient wizards" the visible and invisible add greatly to the picture. Stonehenge is awesome, although I must say Avebury impressed me more with it's sweet sense of the elemental powers, the ancient stones honoring those forces, and somehow including me, and wandering sheep, into the picture. 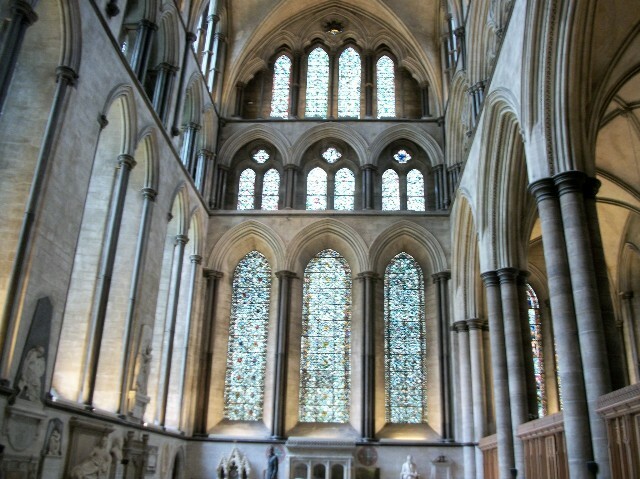 Last, just a few pictures of the beautiful Cathedral just 9 miles from Stonehenge, in Salisbury. 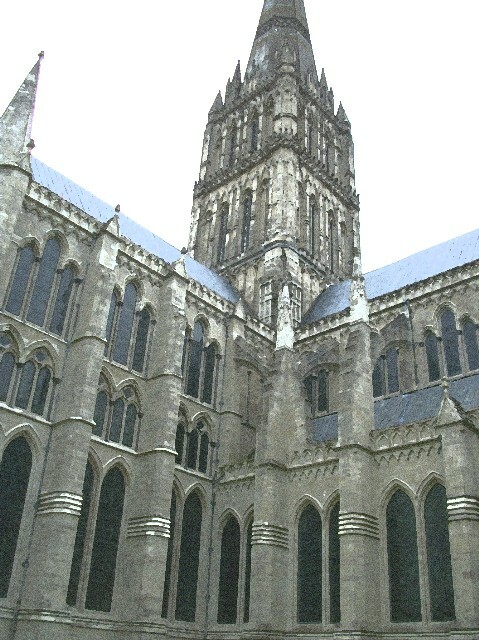 I was fortunate to visit while a service was going on, to hear the pipe organs an a choir. Gorgeous. I have nothing to add, as the pictures say it all. Except, right, the bronze "sorrowful Madonna", a contemporary sculpture that greets you on the way to the entrance. The Madonna's hand has been rubbed to a bright finish, from all the people who touch her in prayer and sympathy........I found that moving. 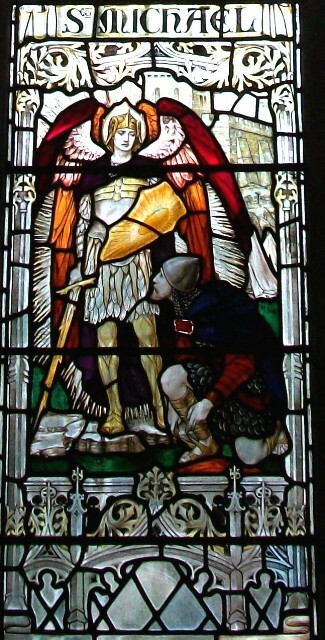 Archangel Michael, window over memorial for war veterans. *** For my own insight, I wanted to copy here some interpretation of Dragonfly from "The Dragonfly Site", which I greatly enjoyed reading. Particularly, I thought of the fact that dragonflies are creatures of water, and also, they were once, mythically speaking, Dragons. Of course the Dragon is entwined in Arthurian legend, and the stories of the two wells, the red and the white, may well be the source of the tale of Merlin and the two underground Dragons. Dragons are also the "dragon lines", the Earth mysteries and ancient Earth Mother. "The dragonfly, in almost every part of the world symbolizes change and change in the perspective of self realization; and the kind of change that has its source in mental and emotional maturity and the understanding of the deeper meaning of life. The traditional association of Dragonflies with water also gives rise to this meaning to this amazing insect. The Dragonfly’s scurrying flight across water represents an act of going beyond what’s on the surface and looking into the deeper implications and aspects of life. The dragonfly exhibits iridescence both on its wings as well as on its body. Iridescence is the property of an object to show itself in different colors depending on the angle and polarization of light falling on it. This property is seen and believed as the end of one’s self created illusions and a clear vision into the realities of life. The magical property of iridescence is also associated with the discovery of one’s own abilities by unmasking the real self and removing the doubts one casts on his/her own sense of identity. This again indirectly means self discovery and removal of inhibitions. The eyes of the dragonfly are one of the most amazing and awe inspiring sights. Given almost 80% of the insect’s brain power is dedicated to its sight and the fact that it can see in all 360 degrees around it, it symbolizes the uninhibited vision of the mind and the ability to see beyond the limitations of the human self. It also in a manner of speaking symbolizes a man/woman’s rising from materialism to be able to see beyond the mundane into the vastness that is really our Universe, and our own minds. " And together we make a great medicine of love. "Waters of the World" poured into the river. 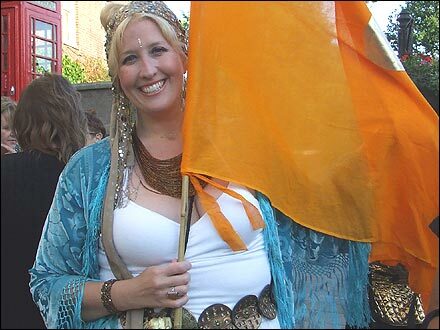 "Nobody is sure of the origins of Morris dancing, but we believe that it was based on pre-Christian fertility dances. 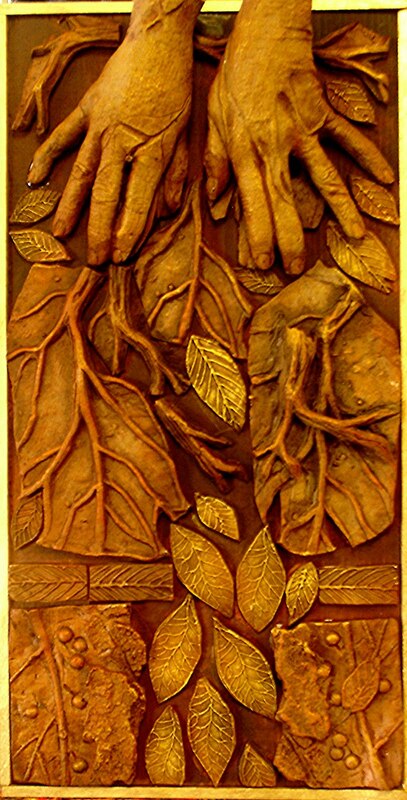 It has elements of circle dancing, resurrection and death and ritual combat deriving from our earliest pagan forebears. The fertility dances (necessarily male) would have taken place on such ancient feast days as the first day of spring, the solstices or midsummer's day. When the Christians took over the old festivals they would have danced on "high days and holy days". During the 19th century, when most villages had their own Morris side, the custom started to wane. This has left only a few places with an unbroken tradition of dancing. In 1989 Cecil Sharp started to collect and record Morris dances after seeing the Headington Quarry men dance. Although most of the dances that you will see were collected by Sharp, they, and the music, have evolved over the years. The world of the Morris is clearly indebted to Sharp and his work. People always ask about the bells, sticks and hankies. the bells and waved hankies are supposed to ward off evil spirits while the sticks represent ritual combat. We like to think it works!" I have to say, everything they say about Glastonbury is probably true. As an artist and mythologist, "truth" to me is a subjective and relative business, full of circular way ways of seeing, so "geomantic intensity", "genus loci", "grace" and the Lady of the Lake and the Springs can all be equally true and potent. And in some way that I leave to far more scientific minds than mine to explain, intention has a lot to do with it as well. 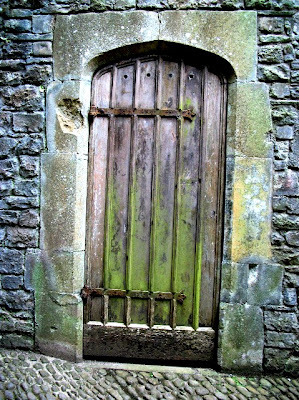 My intention was to make, as so many have before me, a Pilgrimage to Glastonbury - and walking forward into the experience with that intention was like opening a door for the holy to come in. And "holy", like "wholly" means to me experiences that expand circular vision, that reveal the "wholeness" of things. A place of pilgrimage, and an intention of pilgrimage, open such doors of perception. Circles, like the Vesica Piscis, sacred symbol of the Goddess, that caps the Chalice Well, Circles within Circles. Circles within circles, like the ripples on the holy waters of the springs, everywhere I turn. The night before last I went to a talk by a local author, and was handed a program from the organization he was speaking for - in it were two articles, one about Sedona, Arizona, the other by a woman named Patricia Cota-Robles, who lives in Tucson, Arizona (where I'm from). How likely is that? But it got my attention. 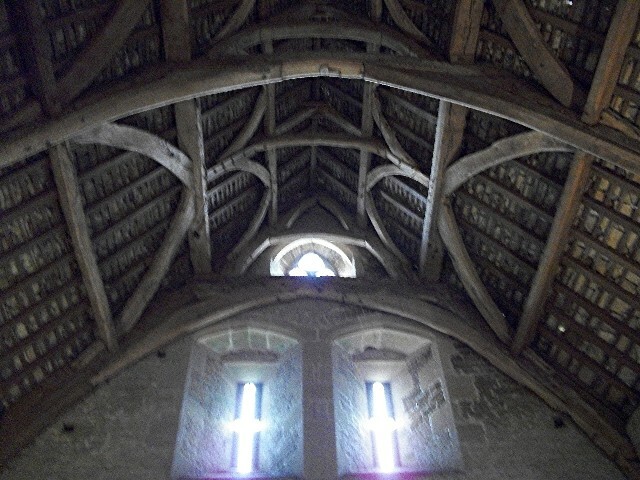 The talk was much about centering...........and finding the holy where you are. 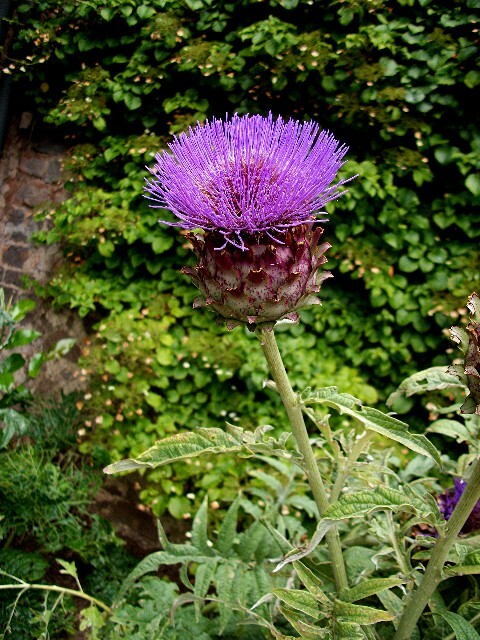 Places like Avebury and Glastonbury are sacred indeed, but we can also make a shrine in our backyards, our studios, we can bring the sacred into how we receive and are nourished by the food we eat, how we prepare it for a friend who's come to dinner. So......another Circle for me was to finally meet again my mentor Sig Lonegren and his wife Karen. Sig, in some ways, set me on my path of wondering about sacred places, and he taught me how to dowse for the subtle energies of place. That was 30 years ago, when he taught in Vermont, and I shall always be grateful for the catalyst. 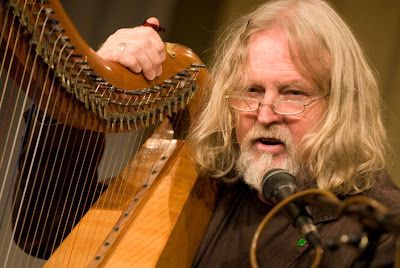 Another powerful catalyst, for me, was the poet and bard, Robin Williamson, whose music and stories I have carried with me for many years. It began at the Unitarian Church in Tucson, when I heard him perform. Well, guess what? It's my last Saturday here, and he's performing at another church, this time St. John's right here in Glastonbury! I can't believe it, but, blessed be, here's another Circle. So I'm taking the liberty of sharing again a post and story on video about Robin I wrote earlier this year. Say not "I have found the truth", but rather, "I have found a truth." Say not "I have found the path of the soul" but say rather "I have met the soul walking upon my path." For the soul walks upon all paths. The soul walks not upon a line, neither does it grow like a reed. The soul unfolds itself, like a lotus of countless petals. 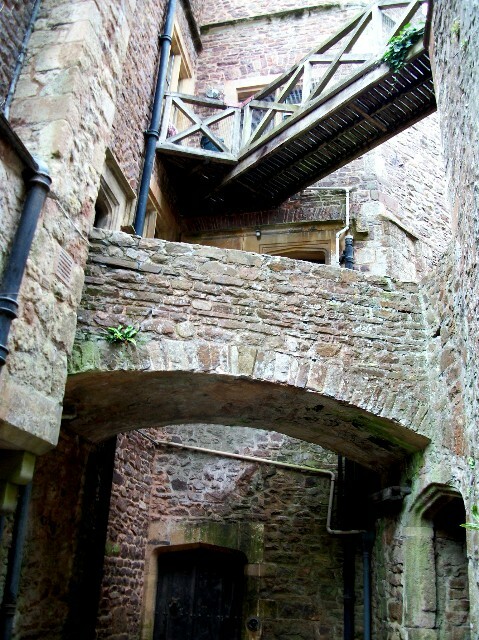 I find myself fascinated with the stone history of England, of the British Isles. Whether prehistoric Avebury and Stonehenge tracing the Dragon Lines and the eddies and flows of the subtle body of the land, or the tall spired medieval cathedrals with their stonework carved and curved and tendrilled like vines and trees that will never wither, the stone castle I visited, once a Saxon fort, or the heavy, massive old slate roofs I find it hard to believe continue to be supported, not for decades, but for centuries. Everywhere the people of this rocky land patiently took the stones, great and small, and built everything they inhabited, whether temple, church, barn or well. These stones have songs in them, stories with almost-words. I take my shoes off, bare feet on the cold bedrock, perhaps to listen. I think this pebbled mosaic, this quarried bedrock, these standing stones so carefully placed by ancient hands ..... speak, strangely, of constant change. All the feet that have walked here, the hands shaping, touching, shimmering. I have been dead, I have been alive." 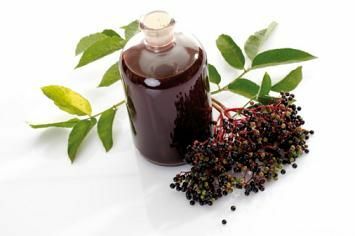 "The deepest spiritual energies of the Red Spring relate to the future: to the emergence of a reborn and rebalanced divine masculine energy that can complement and eventually conjoin with the Goddess energy that is so venerated in Avalon. This last stage of the alchemical work, involving the balanced union of a rejuvenated solar king-god with a goddess-queen in a symbolic heart centre, such as the pool in King Arthur's court, has long been delayed by our deep neglect of the divine feminine. 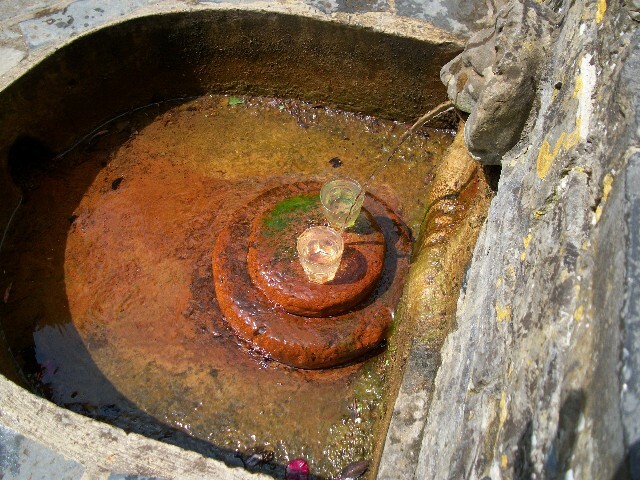 Since the recent cleansing of the White Spring, the spiritual and healing powers of the two springs can now manifest in a more balanced way." Nicholas Mann and Philippa Glasson, "The Red and White Springs of Avalon"
I seem to be unable to leave Glastonbury.......my plans of travelling to Scotland, and then Cornwall, are frustrated by the fact that it's high tourist season during the month of August, and virtually everything is booked up, and the price is also doubled! I haven't been able to find a B&B, a hostel, or a hotel that had a vacancy, or that I could afford. Yet I have kindly been offered a spare room here by a priestess from the community. Many circles of my life seem to loop and complete here.....so I feel certain that Avalon is where I should be, and the Lady of Avalon has something to stir in me. This has been a pilgrimage place for countless years...........from the Stones of Avebury to the great ruined Abbey of Glastonbury, people have come here, and they continue to come, many I suspect, not really knowing why, but drawn nevertheless. They come to touch the Holy Places that have their ultimate source in the body of the life-sustaining, mysterious, creative, deep powers of the Earth. It's good if you can do it in a sacred manner, if you can approach with reverence - but when confronted with the beauty and magic of these places, I don't know that it's necessary. You leave changed. 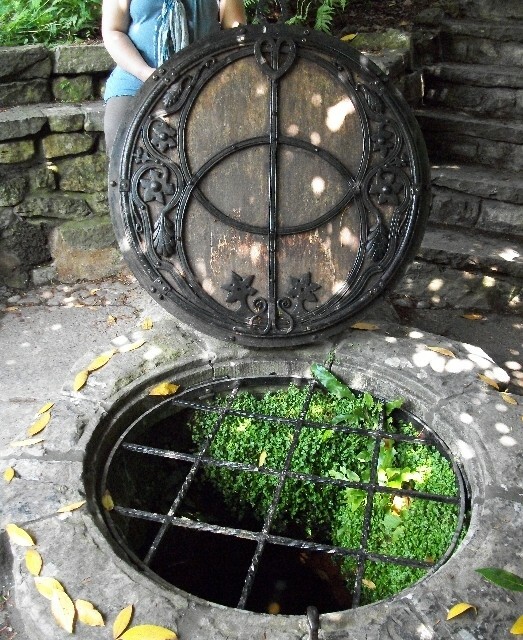 Yesterday I walked to the White Spring, one of the two Wells of Glastonbury. The Red Spring is the Chalice Well, and it's waters carry red iron oxide. The White Spring leaves a white calcium residue where it runs. The White Spring is underground, and illuminated only by candles, which were tended, when I was there, by a young man who reverently changed them and kept the space. I thought of the Roman term for a priest/priestess - the "Flamenalis", the one who lights the flames, and tends the sacred flames, holds the space for others. I entered the dark blind, and only gradually saw the interior with the help of candlelight. Ah, the intensity of that space, the sound of the running water coming from the underground spring, the big dark stone pool illuminated only candles, the whisper of a few "pilgrims" actually taking their clothes off and quietly climbing into the pool. People have set up different shrines in niches of the (large) underground enclosure, and a little Black Madonna figure is enshrined just over the Spring head. There is a shrine for the White Lady of the Spring, who also seems to me to be the Lady of Avalon - she greets you as your eyes adjust. I don't really know that.........the painting could also be offered to Bridget, from whose name the River Brue probably derives, and also, perhaps, the very name of the British Isles, Britannia. Bridgit was the Goddess long before she became a Saint. But I was drawn to a shrine created from twigs and branches, in the center of which was a candle lit painting of a Goddess with offering, open hands. I sat down within the shrine, and truly felt as if I sat beneath the roots of a tree, deep in the Earth. She will Seal Us with Her Seed." I think, in that place, the Goddess, by whatever name you may conceive of Her, can speak to you, and in with a gentle voice that sounds like the sound of water. I used to write poetry, and the wellsprings of that seem to have dried up in me, but that, I think, would be the truer language to use when speaking about that hour of sitting within the Well. **I have to add that I returned today (Sunday) and the space was a bit different experience (nothing could take away the sacredness of the Well), but the gracious and humble young man had been replaced with a caretaker who was possessive and proprietary, immediately informed me in an aggressive manner that photos were "not allowed", and, to make things worse, kept flitting back and forth singing what I assumed she thought were inspiring sounds for the entire 40 minutes I sat within the Shrine. She didn't shut up once, and finally, thanking the Waters, I gave up on my meditation and left. Oh well, maybe that's part of my meditation too. I have been waiting to write about crop circles, largely because there's so much information that has been available (and a lot of disinformation as well). 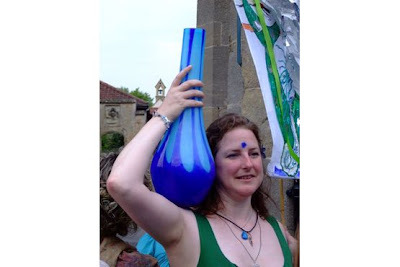 I attended the Glastonbury Symposium, and listened to various experts on the subject, among them Lucy Pringle, whose beautiful photographs, and many years of dedicated research I have the highest respect for. She's been flying over crop circles for 30 years, and has participated in many research projects. At the Symposium she spoke about studies of subjects brain waves ( including herself) within quite a few circles - the results were surprising, showing that the circles produced a trance or meditative state in many who spent time within them. Sig Lonegren, a famous dowser living in Glastonbury (he is also my teacher, and it was a real pleasure to meet him and his wife again after all these years) believes that some crop circles act as batteries - concentrating energies that dissipate after a while (depending on how long they have been present, and also how many people enter them) Of course he comments that many crop circles, but not all, are human made. 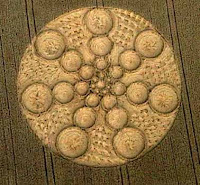 It is clear that there are amazing anomelies surrounding crop circles - many occuring within minutes of them not being there by witnesses, and people having experiences inside of them, including visions, healing, etc. In what they call "authentic" crop circles, there have been electro-magnetic anomilies, inexplicable white powder, and evidence that the circle was formed by short bursts of great heat, resulting in plants being inexplicably bent at joints but not broken, the joints being burst. 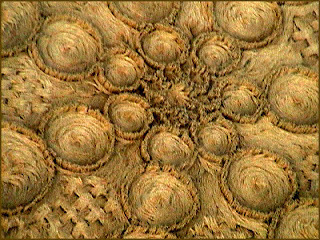 Some plants that occured in crop circles come back larger and healthier the following year, and some , areas not so, or a "ghost image" of the circle occurs in the field the following year. 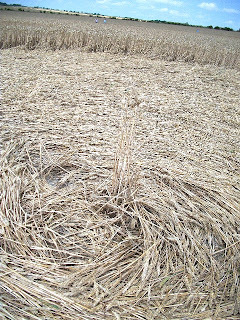 Some crop circle "ghosts" can even be seen in the winter, when snow surrounds the area of the circle, but is not visible on the "ghost". 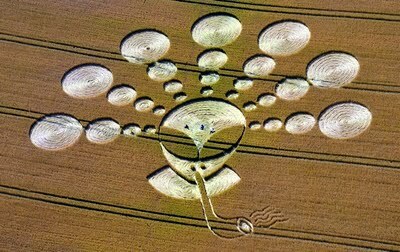 I must also add here that a great many crop circles are human made. I met a woman right here in Glastonbury, who is affiliated with the Temple, who told me that when she lived in Avebury she and her husband belonged to a group of people who made crop circles, for fun, and also because they considered it earth art. 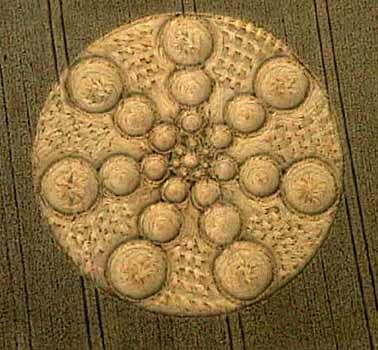 There is a famous crop circle of the Goddess that she told me they made. I see no reason to disbelieve her, and there are groups who have clearly demonstrated their ability to create crop circles, as well as earth art that includes sacred geometry. With anything that has been going on so long, and generates so much interest, is it any surprise that this should be so? 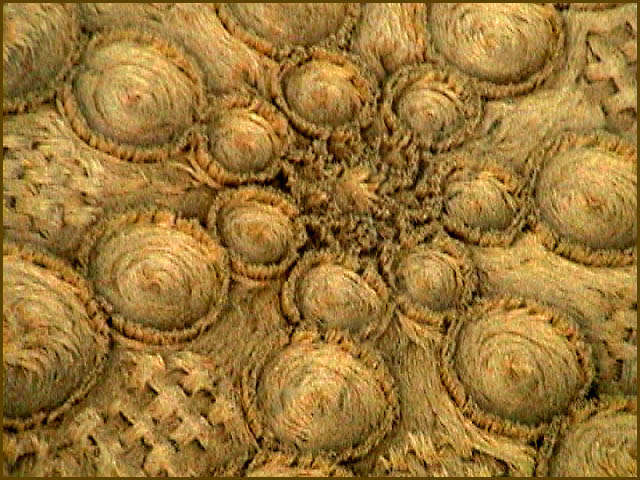 Many circles include universal human sacred symbols - I do not negate them because they may have been created by humans. Why do they do it at night, and secretly? Because they can. Why not admit what they've been doing? Some have, but because destroying crops is illegal and they can go to jail if caught they tend to keep quiet. And the secrecy is part of the excitement - also, apparently there are "true believers" who refuse to believe that any crop circle can be human made, becoming hostile even when they demonstrate that they can. 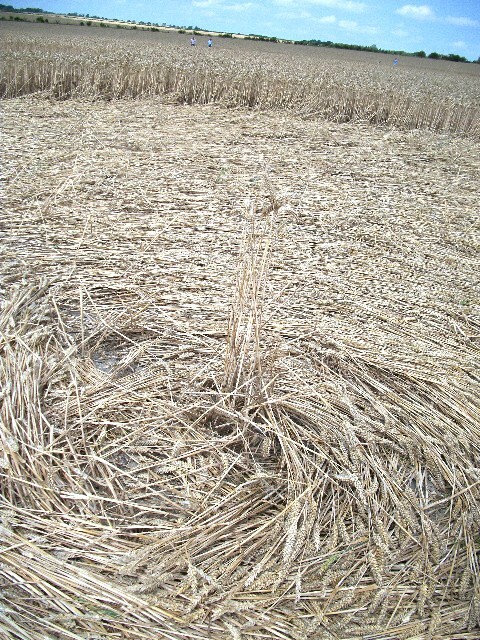 Here's a very funny "crop art" that happened in Wiltshire this past July of an ET smoking a pipe. Please do not think, reading this, that I am thus negating the mystery of the circles. Indeed, my own research this summer, and attending the conference, has convinced me that the phenomenon is real. So, to conclude, I have to say that from what I can understand, this is a great mystery, some are enormously complex and inexplicable - they don't know who made them, and could not be made by any human means, and have many anomalies surrounding their creation and presence. 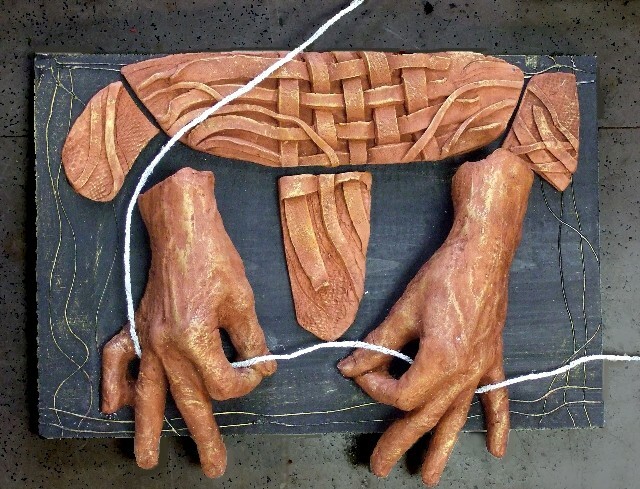 They are communications that, like all symbols, exist on multiple layers of meaning - like dreams, perhaps. There are also many that could, and probably were, made by people. My trip to a Circle was with 5 people, and we left Glastonbury toward Avebury, stopping at the Silent Circle Cafe - a cafe near the town of Devizes (but out in the countryside) that features the 'CROP CIRCLE REPORT" - a map with all the current sites of circles, pictures of them, and information as to when they occurred, and whether they are still in existence. It's in the midst of "crop circle hot spot country"..... and a great place to hang out and meet people from all over the world who are pursuing the Circles. 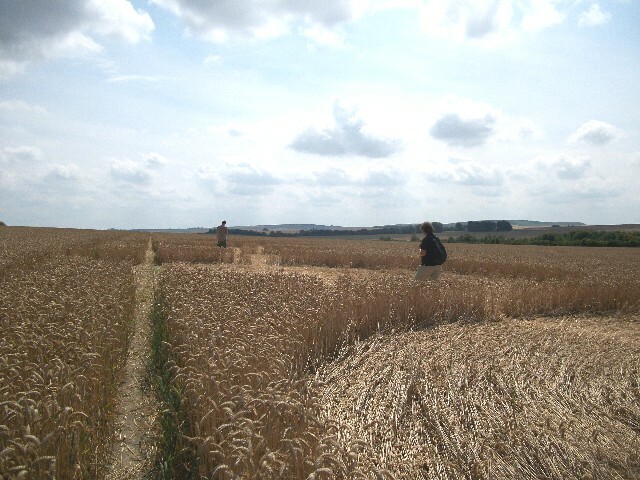 Looking out over that vast mosaic of wheat fields, and the strange march of standing stones and prehistoric barrows that are to be seen occasionally in the midst of it all.........one can well imagine this being a canvas for the "Circle Makers". The crops are currently being harvested, and so many circles are about to become bread or cooking oil (which I found kind of energetically wonderful as well). Like the sheep wandering through the avenues of Avebury, it all seems of a piece, the mysterious, the sacred, and the mundane magic of the agricultural world. it's all about the Great Mother and the true alchemy of the land. We walked for quite a while on the borders of some extraordinarily beautiful golden fields of ripe wheat. The heavy heads of the wheat rustled in the breeze, very peaceful to be in. 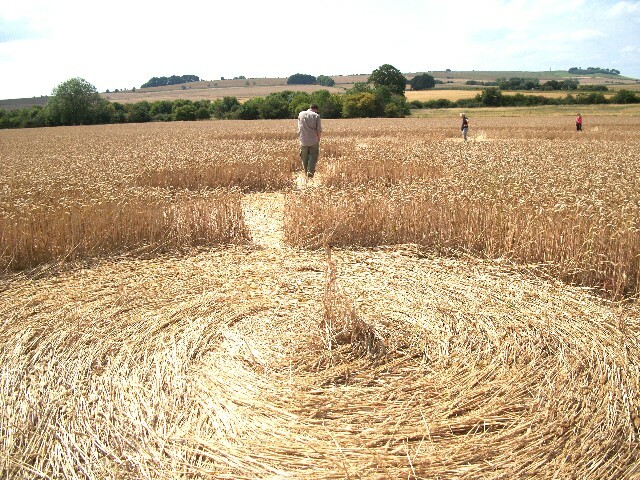 At last we came to the circle........walking along the lines of the tractors (left when the crop was planted) so as to not hurt the surrounding fields of wheat we entered the circles that made up a much larger circle. It was peaceful, and I confess I enjoyed lying down on the soft, swirled bed of the circle. Did I feel any special energy? 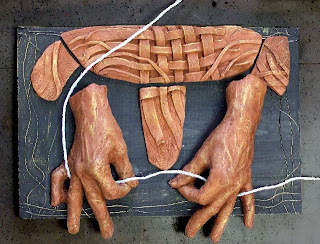 No, and I confess as well to breaking some stems of wheat and feeling that my efforts didn't look very different from the bent stems I walked on. It was, howevever, and "old" circle, having been discovered on the 20th of July. Sig has commented that as a dowser, he's seen that circles seem to lose their energy with time, and depending on the number of people who visit them. 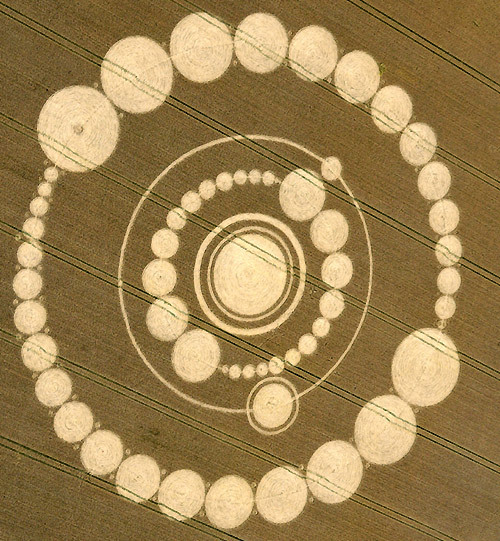 I personally found no evidence of anything strange within the circle of circles, although when one considers the vast scope of it (it's huge), that is pretty amazing to everyone except, no doubt, the farmers who planted the field. I understand many of them are very angry about the phenomenon, although I suppose they are used to it by now as well. I'll close with a trailor from a new movie about the phenomenon that I've heard many good things about. I'm glad I got to walk in one at last. 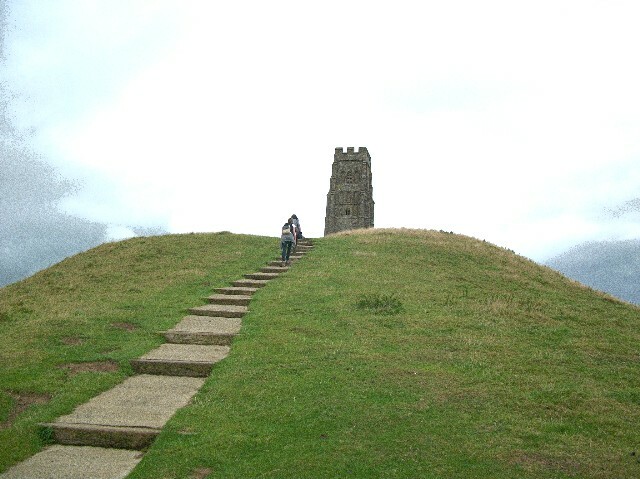 Here's something else I encountered at the Glastonbury Symposium - I had never before heard about the controversy concerning a possible pyramid complex (3 aligned pyramids, with the "Pyramid of the Sun" being the largest). If, indeed, these are, as a number of archaeologists think, man-made structures, then this is the largest pyramid in the world, far exceeding the Great Pyramid of Egypt. 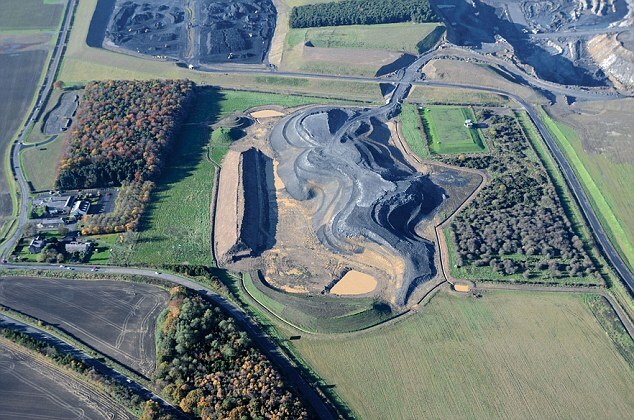 For anyone who has not heard of this, it's fascinating to contemplate. 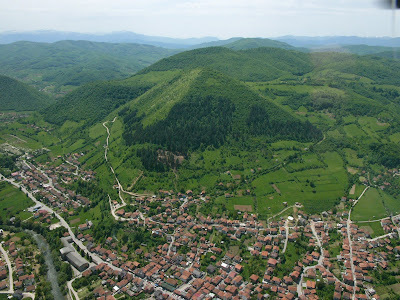 Here's a great article about the "Bosnian Pyramids". "Visoko is within the catchment area of what Lithuanian–American archaeologist Dr Marija Gimbutas (1921–94) labelled "Old Europe", a civilisation also known as the Vinca culture. This culture is dated to roughly 6000–3000 BCE, and many believe that it inspired other cultures, including the Sumerian Ubaid period. 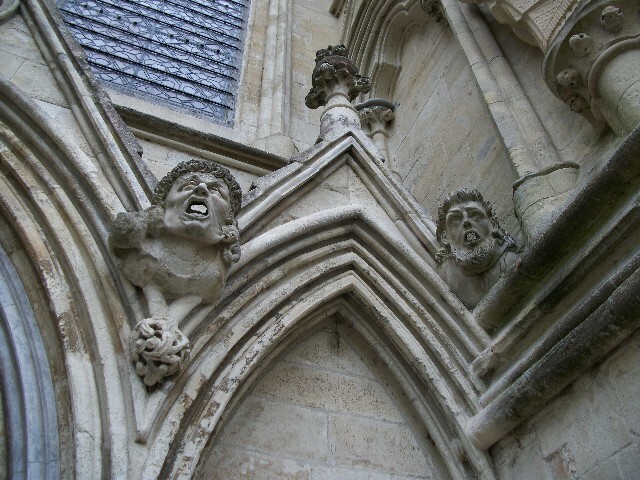 Examples of Vinca statues have been found as far west as southern France. As recently as November 2007, archaeologists excavating a settlement in southern Serbia, believed to be at least 7,000 years old, announced that this civilisation had great expertise in creating bronze artefacts—a discovery that requires a radical re-dating of the Bronze Age. Still, few have heard of the Vinca culture, and here, too, western bias might well come into play. Indeed, the old pyramid paradigm is not merely being held in place with sticky tape, but the notion that Sumer and Egypt were the cradles of civilisation is one that should have been thrown out of the history books many generations ago. In this instance, the personal crusade of Australian-born archaeologist Vere Gordon Childe (1892–1957) forced the Vinca culture to be seen as an outlying cultural entity influenced by more "civilised" forces. Childe's dogmatic stance and clout meant that the Vinca culture received only scant attention and today remains largely unknown. 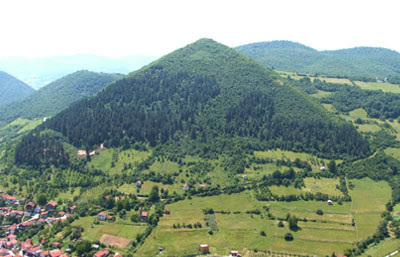 So, what is the Bosnian Valley of the Pyramids? 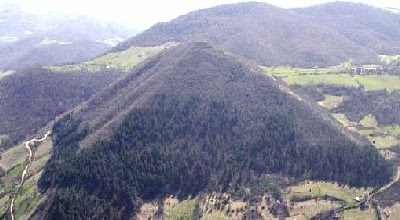 The Pyramid of the Sun, which dominates the skyline over Visoko, has been the main focus of investigations. The structure does not merely look man-made, but with a height of 220 metres it is much higher than the Great Pyramid of Giza and thus would be the tallest pyramid in the world. As is the case with the Great Pyramid, each side of the Visocica Pyramid of the Sun is perfectly aligned with the cardinal points. 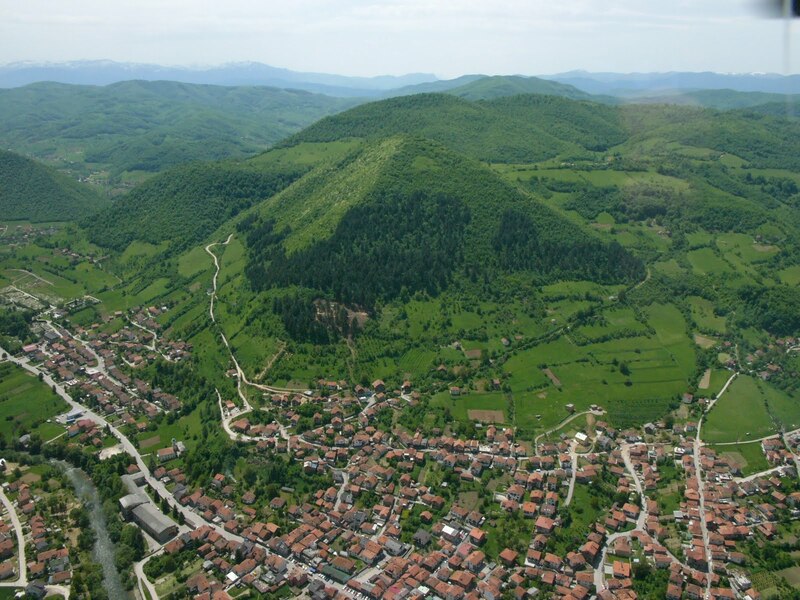 Indeed, as one approaches Visoko, it is hard to believe that it took until 2005 before someone seriously pondered the notion that the hill could be a pyramid. The bottom of the Visocica Pyramid has been built upon, and the streets of Visoko are extremely steep. Most interestingly, Osmanagic was told early on in his research that several home-owners in Visoko had wanted to build cellars but could not because of a cement-like layer hidden approximately one metre below the surface. During the civil war of the 1990s, it was reported that the hill resonated when hit by artillery fire: whereas artillery impact normally produced a sound that lasted one to two seconds, when it hit the hill it created a type of echo that lasted five to six seconds. It was clear that the hill had something unusual about it. tile work excavated from smaller "pyramid of the moon" - human made? 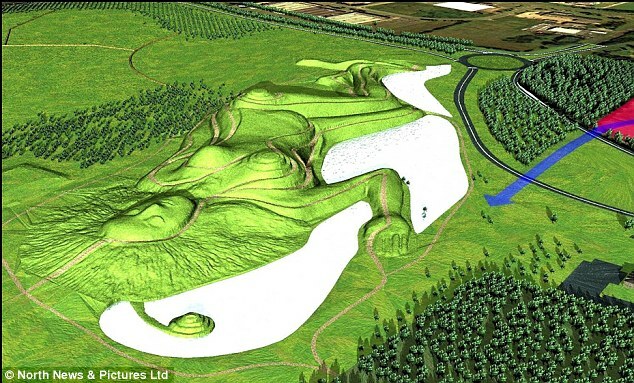 The Great Green Goddess of Britain Rises again! I had to post this article about the Green Goddess of Northumberland, kindly provided by Robur D'Amor. Robur has two fascinating blogs (http://roburdamour.blogspot.com/) - thanks once again, Robur! *** Visited today: Windmill Hill, July 26..... in a vast field of golden wheat.